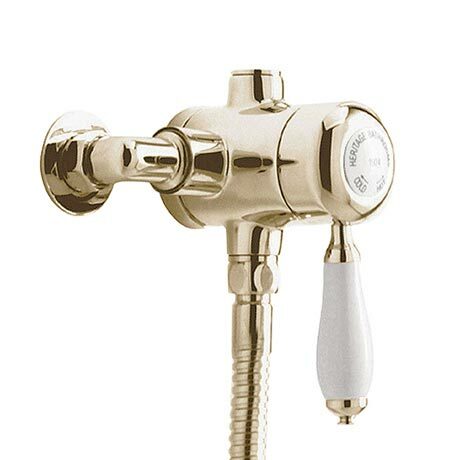 The luxury traditional Ryde single control exposed mini thermostatic shower valve with bottom outlet, manufactured from brass with a vintage gold finish, Heritage's elegant range of shower valves are precision engineered to provide a luxury showering experience. The shower valves are thermostatic so the water stays a consistent temperature even if the water pressure fluctuates. Quality assured by a 5 year guarantee. Suitable for use with a flexible kit and shower handset. The Heritage Ryde shower control was first class for quality. Fortunately the gold colour matched other existing fittings in my bathroom. I was able to fit it myself using the clear instructions.